The Offspring are the latest band to ride the '90s nostalgia wave. But that's okay, because the '90s ruled. The movie might have claimed it happened in 1991, but we all know that 1994 was the real year that punk broke. In the wake of Saint Cobain's self-inflicted shotgun blast to the face, the miserable grunge fad was on its last legs, Pearl Jam fighting a futile war against the ticket bastards, Soundgarden lazily black hole sunning themselves on FM radio, and the singers for Alice in Chains and Stone Temple Pilots shooting heaven knows what into their emaciated arms. Kids needed a fresh alternative immediately, and beginning that spring, they got it. Hole's Live Through This trounced everything coming out of Seattle. Weezer's puppydog-eyed debut became an instant classic among the junior high set. On the punk side, Rancid and NOFX brought exuberant, ska-laced punk tunes to the kids, but it was two California bands who were directly responsible for bringing punk rock to the mainstream, reminding everyone just how fun good rock music could be: Berkeley, California's Green Day, and suburban Los Angeles band The Offspring. More than a decade on, it's interesting to consider the career trajectories of both bands. Both exploded out of the gate with hugely successful breakout singles, Green Day's Ramones-meets-Buzzcocks "Basket Case" and The Offspring's more volatile, yet equally fun "Come Out and Play". Both bands' follow-ups sagged in popularity, their attempts at restoring their punk cred (Green Day's "Jaded", The Offspring's "All I Want") getting an icy reaction from fans. In the late '90s, one band rebounded with a fluke hit, a bitter kiss-off ballad that the world, from ER to Major League Baseball, hilariously mistook for a feel-good anthem (Green Day's "Time of Your Life"), the other stumbling back into the limelight with a corny novelty song (The Offspring's "Pretty Fly (For a White Guy)"). While Green Day's affable American Idiot launched the band into the stratosphere in 2004, thanks to singles the mainstream crowd loved and a couple of nine minute punk songs that somehow gave the band instant credibility in some critics' eyes, The Offspring continued to safely stay the course. Perhaps a little too safely, as recent albums have shown the band coasting, displaying little of the songwriting skill of their compadres from up the coast. 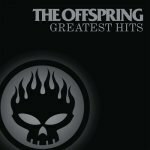 With Green Day soaring, and The Offspring flagging, what better time than now for The Offspring to play the nostalgia card? On the surface, it may seem like an empty major label ploy to hastily release a Contractual Obligation Album to squeeze every cent out of the band's back catalog, and at 44 minutes, Greatest Hits is a rather short career retrospective. However, when you take a few steps back and give this CD a listen, you have to concede that this band has put out some superb singles over the past decade. It can be easy to forget just how good these guys can be; you never notice when they're gone, but when they're around, you're happy to have them there. The CD kicks off with new track "Can't Repeat", a workmanlike tune that doesn't hide the fact that it's essentially a note-for-note copy of "The Kids Aren't Alright". These guys have never been lyrical geniuses ("Life goes on/ Come of age/ Can't hold on/ Turn the page"), but this little dose of harmless, pseudo-philosophical kiddie punk does serve as an adequate introduction. After that, the disc shifts back to the monster 1994 album Smash, and works its way back chronologically to the present. "Come Out and Play (Keep 'em Separated)" will remain this band's calling card, and for good reason, for it's a first-rate rock single, from Dexter Holland's defiant, flat vocals, to guitarist Noodle's snarky snake-charmer lick, to the band's brilliant use of stops and starts, the dark tale of urban teen warfare is less a social commentary than a grimly humorous spoof of gang violence. Nearly as great is "Self Esteem", which brilliantly spits in the face of the grunge crowd, starting with the razzing chant of the song's Nirvana-esque riff. Truth is, this would have made a good Nirvana song, Greg K.'s stuttering bassline underscoring Holland's tongue-in-cheek lyrics ("I may be dumb, but I'm not a dweeb/ I'm just a sucker with no self esteem"), as he hits just the right note with his deadpan delivery. 1997's Ixnay on the Hombre was an ill-fated attempt by the band to come off as serious artistes, and although the album's two singles fell flat commercially, they were never as bad a people originally thought: "All I Want" is nothing more than a carbon copy of every Bad Religion song ever recorded, but a fiery, impassioned one at that, while the morose "Gone Away" skillfully treads the line between punk and nu-metal, Holland's wracked howl taking on a surreal, borderline ridiculous, Glenn Danzig quality, as he wails some nonsense about reaching out to the sky and calling out some chick's name. It's a mess, but a really catchy mess. Pop punk always works best when it's not taken too seriously, and the band quickly righted the ship on 1998's Americana, choosing to view the world through a teenager's eyes, instead of from those of a jaded rock star, and the public bought in, big time. On the surface, "Pretty Fly (For a White Guy)" might seem little more than something Weird Al Yankovic would do, but when the sample of the intro from Def Leppard's "Rock of Ages" kicks in, segueing to a sudden Latin hip-hop beat (complete with female singers purring, "Give it to me baby"), it displays the kind of musical daring few punk bands dare to attempt. Drawing on both the Latin and punk sounds from the band's hometown, the song is wickedly catchy, and although the Vanilla Ice reference was stupid even in 1998, it works well as a lampoon of white suburban thug wannabes. The band's post-Americana output struggled to cash in on their regained success, as 2000's "Original Prankster" (Pretty Fly Version 2.0) was a disaster, and 2003's "Hit That" (Pretty Fly Version 3.0) was only a marginal improvement. However, despite those songs, and the tuneless bore "Defy You", the band has always shown flashes of inspiration on tunes such as "Want You Bad" and "(Can't Get My) Head Around You", not to mention the overlooked Americana gems "The Kids Aren't Alright" and the goofy "Ob-La-De Ob-La Da" charm of "Why Don't You Get a Job?". Unlike Green Day, who are weirdly bent on becoming a punk version of The Who, The Offspring continue to tow the pop punk line, which is what they do best. They may be twice the age of most of the other bands at this year's Warped Tour, but as this disc proves, they can transcend cookie cutter punk, when they want to.